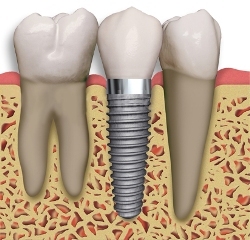 Dental implants are a great way to replace a single missing tooth in your mouth. Dr. Robert Thein specializes in dental implants and can fill in any gaps between teeth with a carefully placed dental implant, topped with a dental crown for a complete look that resembles a real tooth. Why Dental Implants over other options? There are a few ways of replacing missing teeth in your mouth, but dental implants are the most advanced solution to date. Typically in the past, a fixed dental bridge was used to replace a single tooth – but this method did not offer the same functionality that we see in dental implants today. Tooth-supported dental bridges require the assistance of surrounding teeth. Adjacent teeth have to be ground down in order to help cement the bridge, but a dental implant does not require this additional step in order to function. Dental implants for a single missing tooth do not harm other surrounding teeth. Dental implants integrate with your jawbone, forming a very strong bond. This is what gives dental implants the bulk of their functionality. This strong bond allows you to chew and utilize your teeth the same way you would if you had a real tooth. A dental implant procedure to replace a single tooth can be performed in a series of necessary steps that solidify the implant into place. The first step requires that an implant dentist evaluate your mouth and jawbone to find out if you are capable of supporting a dental implant. After this, you will make an appointment to comfortably receive a titanium implant that is set into your jaw. It will take several weeks for your mouth to heal and form the strong bond that gives implants the durability we have come to expect. Then, you will receive an abutment post that is attached to the titanium implant, which a dental crown is finally placed on. You will need more than one appointment to complete the procedure.